Weekly Pokemon Broadcasting Station #007: "Takeshi! 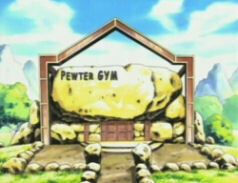 Save Nibi Gym!" Pokémon Chronicles Episode 05: "A Family That Battles Together Stays Together!" 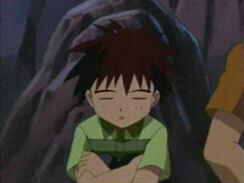 After separating from Satoshi and his friends in Jouto, Takeshi returns to his home in Nibi City. When he arrives, he meets up with his father, Munoh, who tells him that his mother has returned and converted the Nibi Gym into a water-type gym! Takeshi becomes furious and demands a match between his mother and father to determine the gym's future. After Munoh's Golonya loses against Mizuho's Marill, it is decided that the gym will become a dual-type gym! Jiroh, one of Takeshi's brothers, runs out of the house after hearing this news. He tells Takeshi that he wants to be a rock-type Gym Leader but believes that his parents' decisions have made that dream an impossibility. Takeshi tells Jiroh not to give and up and promises to show him the strength of rock-type pokemon. The next day, the battle between Mizuho's Mantain and Takeshi's Iwaku begins. Takeshi's pokemon uses Dig attack to burrow underneath the gym's pool, causing all the water to drain out of the battle field. With no water to flop around in, Mantain is quickly defeated by Takeshi's pokemon. After the battle, Takeshi gives Jiroh his Iwaku, Ishitsubute, and Crobat to help him in his quest to become a Gym Leader. Now that the crisis at his family's gym has been solved, Takeshi leaves Nibi City to rejoin Satoshi in his adventure through Houen. "His good-for-nothing father left the family to become a Pokémon Trainer and they never heard from him again. Brock's heartbroken mother tried her best to hold things together, but sadly, she passed away." This line is a mistranslation of the original Japanese line in "Showdown in Pewter City," way back at the beginning of the first series. In the Japanese version, Munoh tells Satoshi that Takeshi's mom actually ran away from home. At the time, 4Kids probably thought the change wouldn't be a big deal. After all, we're never actually going to ever see this woman, right? Who could have known that, four years later, the Japanese producers would create a special featuring a character 4Kids killed off? When news of this episode's plot surfaced, all the fans had the same reaction - what is 4Kids gonna do? Are they going to leave it undubbed because translating it would reveal their mistranslation? Would they rewrite the episode to make Mizuho a girlfriend or something? Or would they just hope kids forgot their goof-up early in the series and leave everything as-is? As we all know by now, the company went with the third option, since I guess 4Kids figured we'd all forget. We clearly haven't. Aside from that, the episode itself is a rather good one. I'm not a huge fan of Mizuho's character design since she doesn't look like any of her kids AT ALL, and the gym could have been decorated even more outlandishly, but it was still a good episode. We get to see more of Takeshi's family, which is always good, and we are given proof that the writers of the TV series (at least in Japan) have something resembling a memory. The dubbed version goes back to the standards set forth by "The Legend of Thunder." Whoo. I guess the last episode was just a fluke or something, because this one has the same music, pointless editing, and translation problems that the serie's opening episodes did. Are the rest of them going to be this bad? Flint sounds like he's been recast for this episode, but I'm not really sure. I mean, the voice sounds different from the one we hear in "Showdown in Pewter City," but then again, so does everybody else's. His VA could have just forgotten how he pulled off the old Flint voice or something. For your reference, this episode was released between episodes AG 002, "Ancient Pokemon and the Mysterious Army!" ("A Ruin with a View") and AG 003, "Touka Gym! (Pikachu) vs. Yarukimono!" ("There's No Place Like Hoenn"). 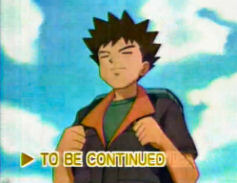 In the Japanese version, Takeshi no Paradise is used as the episode's ending theme. Iwaku, Mantain, and Forretos keep their Japanese voices. Just like in "The Legend of Thunder," all of the Japanese music is replaced in the dub with 4Kids' stuff. Every last bit of it. However, 4Kids does allow two scenes to play without any music at all, so that's pretty cool. 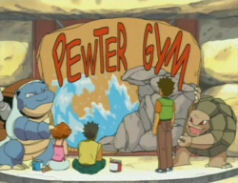 "Nibi Gym" is changed to "Pewter Gym," just like it was in the fifth episode. However, if you compare the edit in this episode to the similar edit made in "Showdown in Pewter City," you'll notice that the font is quite different. 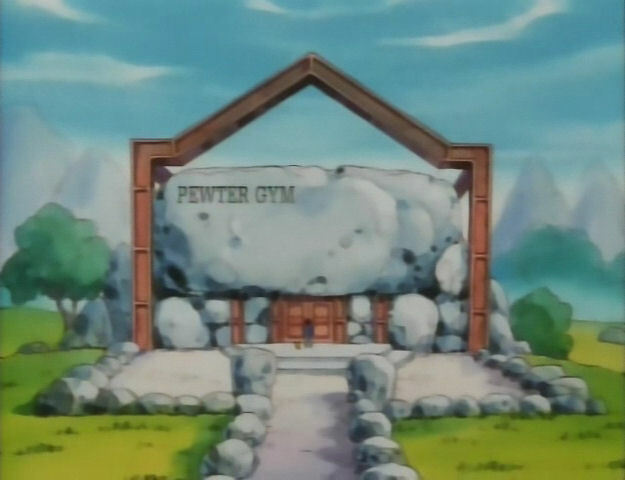 I guess the inside of the gym wasn't the only thing Lola redecorated, huh? 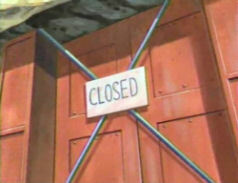 Later, the CLOSED sign has its text erased. You can view larger versions of these and every other paint edit here. Originally, Mizuho's hobbies were ballroom dancing, gardening, and astronomical observation. In the dub, Lola's hobbies were astrological signs, juggle yu yu sticks (whatever those are), and yodeling. You know how, after the battle between Lola and Flint, they talk about how they first met? They talk about how Lola's Poliwag completely destroyed his Graveler with a Hydro Pump attack before the two start to reminisce about the moment they knew they were meant for each other. The background gets all rosy, Flint and Lola hold hands, and Brock tells his parents that he'll battle Lola to prevent the Pewter City Gym from becoming a water-type gym. Well, the dub rewrote that part completely. Originally, Munoh asks Takeshi to take good care of Golonya, implying that he's leaving the gym for good. He tells his family that he knows when he's beat and says that the gym will be fine with Mizuho taking over. Mizuho asks (in a rather annoyed tone) if he'll return to selling rocks outside of town before saying that she doesn't understand his reasoning at all. She then says that she knows that the gym is very important to him and doesn't want to do anything that will make him unhappy. At this point, the rose background appears and the two parents hold hands. The scene ends with Takeshi telling them that they'd better discuss what they're going to do with the gym, offering to take care of his siblings while they decide. With the dub, they screw around with characters' backgrounds (fabricating a "first meeting") and introduce the idea of Takeshi battling his mother too early. It also doesn't really explain why Lola and Flint leave dinner up to their son while they sit in the gym and talk about its future. 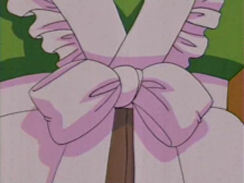 A two-second close-up of the back of Takeshi's apron right before the scene showing all the kids cooking is removed from the dub. The next rewritten conversation occurs while everyone's making dinner. Originally, Saburoh (the kid with the pink/red shirt) asks Takeshi if their parents will be ok after their mini-argument at the gym. 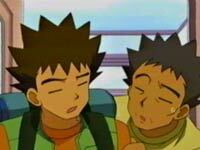 In the dub, dub-Saburoh is talking to Forrest instead of Brock, telling him that he likes every girl in his class. By the way, all this stuff about Forrest being super girl crazy is dub-only. 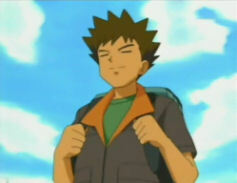 4Kids kind of turned him into a mini-Brock just for the hell of it. And the very next scene has its script messed around with too! There sure are a lot of rewritten scenes in this episode, aren't there? Originally, in the scene after the cooking scene, Munoh tells Mizuho that he was upset that she was always involving herself in all these errands. She responds by saying that she did all the shopping and various hobbies to draw attention to herself since he's always so busy with his Gym Leader duties. She wanted to be with him more often, so she sort of took over the gym so she could always be by his side. Munoh says that he's felt the same yearning to be with her, and the scene ends with the two holding hands. In the dub, Flint thinks that Lola's been doing all these hobbies because she's bored with him. She tells him that it's not the case, but never really gives the reasons she's been keeping so busy with these hobbies. Then they just sort of hold hands and stare into each others' eyes. The dubbed version also says that the two are married when no such thing is said in the Japanese version. I mean, we can assume that the two didn't have ten kids out of wedlock, but we really don't know that. 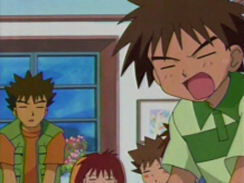 Mizuho asking Takeshi how he became such a good cook and him responding "Because you two were never in the house" is changed to Brock asking Lola when they're going to have their battle. 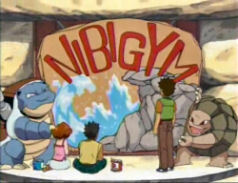 After Mizuho and Munoh announce that the Nibi Gym will become a dual type gym, Jiroh stands up and tells his father to consider how the rock-type pokemon won't be able to battle with that big pool in the middle of the battlefield. This eight second scene, which would occur right before Forrest's "You're going to turn our gym into a laughing stock, dad!" line is cut out of the dub. A second is trimmed from the pan shot of the rocky area Jiroh runs off to after dinner. The shot during which Forrest says "Yeah, this is where I come when I wanna be alone" is a second longer in the Japanese version. Jiroh never asks Takeshi about the girls he's met on his travels in the Japanese version like he does in the dub. Originally, Jiroh asks if Takeshi had always wanted to be a Pokemon Breeder, thinking he had only recently made this decision. Takeshi replies by saying that he has and then remembers that he never really told Jiroh about his goals. After Forrest's "Talk about the girls!" line (right where the previous dialogue edit ends), there's a ten-second scene in which Takeshi tells his brother that Pokemon Breeders get to learn about all the different types of pokemon. Then, the scene when Forrest says "Now I can't wait to get outta here and start my adventures!" is shortened by four seconds. The shot of the moon during Forrest's "Let me ask you something, Brock" is shortened by two seconds. 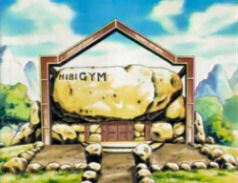 Two seconds are trimmed from the establishing shot of Nibi Gym. 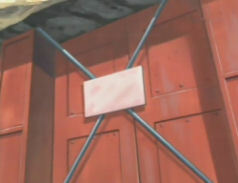 The sign Munoh paints is changed in the dub. The letter P on Munoh's paint bucket is also erased. Two seconds are trimmed from the shot of Mantain and Iwaku facing off before the commercial break. Later, a second is trimmed from the shot of the water being drained from the pool before the shot of Mantain flopping on the pool's bottom. The dub cuts out the most important scene in the episode. Like seriously, without this scene, the entire point of the episode is lost. Of course, I'm talking about the scene where Takeshi gives Jiroh all his pokemon. 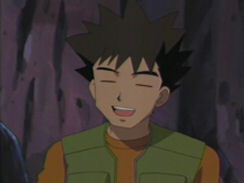 Now we do see Brock give Forrest his Onix in the dub. However, what we don't see in the English version is a 22-second scene showing Takeshi give his Ishitsubute and Crobat to his younger brother as well! Part of the point of this special, other than showing off Takeshi's mom, is to show how he ended up with the team he takes with him to Houen. So by cutting out this scene, people are going to wonder why Brock didn't take his Crobat and Geodude with him to Hoenn. All they can do is assume that he left them with his family. I made a bunch of screencaps of the scene here so you can see what's been removed from the dub. The final shot of the Nibi Gym is shortened by five seconds in the dub. As Takeshi is leaving, another 22-second scene is cut. In this scene, Mizuho worries about Takeshi having everything he needs for his journey, which is one of the few times she actually acts like a mother. One of the things she asks about is his pokemon, and Takeshi responds by reaching into his pocket and calling out his recently evolved Forretos. He then retrieves it, saying he wants to spend time training it to see what it can do. TO BE CONTINUED is painted away.